Today is Aero’s sixth birthday. We’ve given the Pack (and their forebears, Mr. Byte and Chewy) cake and lemon bars on their various birthdays down through the years, with good results. Dash, however, is peculiar in that he simply doesn’t like sweet things. So this time we took a quarter pound of good burger and divided it four ways. (L-R: Jack, Aero, QBit, and Dash.) We were out of birthday candles, so I took a plumber’s candle and stuck it in Aero’s portion. It’s also been two weeks since I last posted here, which is well beyond my usual threshold of pain. Insiders know what’s going on: I have a novel to finish. And I’m not trying to finish it just to get it off my do-it list. No sirree: An editor at a significant press has asked for the full manuscript. Boy. Nothing like a little request like that to light a fire under a guy. I have a pair of hard deadlines now: Finished manuscript by 8/31. Polished manuscript ready to ship by 9/15. 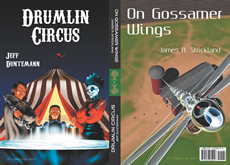 Today was a milestone: I hurtled past 53,700 words, which was the finished length of Drumlin Circus. That means that Ten Gentle Opportunities is the longest piece of fiction I’ve written since The Cunning Blood crossed the finish line on Good Friday 1999. It is also the strangest. At my Clarion workshop in 1973, Lloyd Biggle, Jr said during a guest lecture that you can’t mix SF and fantasy. I’ve had it in my head ever since then that when Biggle’s words reached my ears, it was like swearing on the Runestaff: I knew I would damned well do it someday. I admit it. The romance has been hard. Reading romance novels to see how the pros do it was not especially helpful. Worse, I have no real-world experience engaging in screaming matches with significant others, of whom there have been exactly four, anyway. The romance may thus seem less real than the magic, which might be described as Supernatural Pascal. What’s been harder than the romance has been maintaining the mood for 53,000 words. Humor is just, well, hard, which is a topic worthy of one or more entries all by itself. I think it works, but it’s hard to know until the whole thing’s done. I suspect my beta testers will tell me. If they don’t, my editor will. 53,800 words down. 26,200 words to go. Three weeks. Watch me. I didn’t know this until the other day: The instrumental riff in ELP’s “Touch and Go” is not ultimately from Ralph Vaughan Williams’s “Variations on Greensleeves.” It’s a far older folk melody called “Lovely Joan,” and the song is about a girl who, when asked by some aristocratic lout to hand over her virginity in exchange for a ring and a roll in the hay, keeps her virginity and steals his horse instead. Much better deal. Here’s a tool to see if your email was on one of the 400,000 accounts recently leaked from Yahoo. One of the big downsides of the ASUS Transformer Prime is that the micro SD card pops out of its slot very easily. I found mine on the cushion of my reading chair the other day, and have no least clue how I managed that, apart from sitting there and looking at some weather maps. I’m evidently not the only one with this problem. I haven’t been over to The Consumerist in some time, but when I tried to go there the other day, Google marked it as an attack site. There’s not much to go by in Google’s details page, but it looks like an ad vector. This is why I use AdBlock Plus. (I went there from Linux and nothing bad happened.) UPDATE: They fixed the problem. Lesson: Nobody’s immune. Use AdBlock Plus. Be sure to watch for auroras tonight, as far south as (I hope!) Colorado. Look east just before dawn and you’ll catch Jupiter, Venus, and maybe the crescent Moon. A ride-em Iron Trilobyte! Yee-hah! The estimable Janet Perlman recently posted a link to an article suggesting a “new” concept in ebook piracy protection that doesn’t involve any sort of encryption or tying of files to a particular device. The gist of it is to embed a purchaser’s personal information in the file purchased. If the purchaser knows his/her name or address are somewhere in the file, well, they’re less likely to post it on Pirate Bay, no? This concept is not new; I remember talking it as long as ten years ago, when ebooks were still exotica. It’s as wrongheaded as it is obvious, for the following reason: The fastest-growing source of files shared on Bit Torrent is material taken from stolen readers, tablets, and smartphones. If somebody swipes my tablet and the files stored on it are somehow traceable to me, then once the files appear on the file sharing networks, publishers might assume that I was the one who uploaded the files–which in most cases is a felony. This is true whether or not my name is actually embedded in the files. A serial number or database key pointing to my sales record in the publisher’s store would be enough. I’ve written before about massive ebook collections available on pirate sites. The file I mentioned in that entry was an old one, and crude. Newer and even bigger ones are available now. (No, I won’t tell you where they are.) Specialized collections are turning up as well, as specific as books on programming for Android. Driving the trend is the appearance of specialized private Bit Torrent trackers catering to ebooks. If you’ve never studied up on the torrent scene it’s a little hard to explain, but Big Media pressure is driving a lot of torrent traffic into a darknet of members-only trackers that keep their members on very short leashes. To avoid getting kicked out you have to upload as much as or more than you download. Of course, if nobody wants to download what you upload (because it’s of poor quality or they already have it) your ratio goes down and the admins show you the door. This creates pressure to find new material to upload, especially in private trackers with few members who very quickly grab everything of even minor interest to them. The torrent scene is a numbers game, and ebooks are small files compared to movies or TV shows. So collection editors are grabbing files anywhere they can to spin out new collections. If your device is stolen, your files will find their way to the pirate sites. If your name (or some other identifiable traceable to you) is in those files, you’re the one in trouble, and not the pirates themselves. File piracy may be an unsolvable problem. The last thing we want to do is propose solutions that might turn completely honest purchasers into criminals–thus providing a perverse incentive to stop buying, and pirate other people’s files instead. She looked at me funny. She does that a lot; it’s part of the Uncle Jeff job description. So while pushing her I prepared to answer the obvious question: How do I do that, Uncle Jeff? I stood there for a second before I realized that I had not pumped a swing for, well, decades. I wasn’t entirely sure I remembered how to do it. I gave Katie an extra big push and jumped onto the swing next to hers. As you go forward, pull back on the chains and stretch your feet out. When you start to go back, stop pulling on the chains and pull your feet underneath you. Wait a minute. Wait one damned minute! How does that work? I mean, I’m not pushing against the ground or anything else, and not hurling reaction mass. I realized that while the body remembered clearly how to pump a swing, the mind could not explain it. I vaguely and anciently recalled reading something about a swing with a kid on it acting as a parametric oscillator, but the details were just gone. My guess at the time was a good one: When you pump a swing, you’re raising and lowering your center of mass a little by “bending” the pendulum, synchronized to the timing of the swing’s motion. That adds energy during the forward motion of the swing. There are explanations all over the Web, but the one I found by Dr. William Case at Grinnell College was the best, including several short video clips. It’s an amazingly subtle business. I’m kicking myself now for not thinking to try the obvious enhancement, which is pushing forward on the chains at the rear extreme of motion. Next time. Katie didn’t quite get it but she gave it a good shot (heck, I was at least six before my cousin Diane taught me circa 1958) and with a little practice she’ll remember it well past her sixtieth birthday in 2066, and possibly even into the 22nd Century. Some things are just timeless. I’m trying to write 38,000 more words on Ten Gentle Opportunities (basically, the rest of it) by Worldcon, so I won’t go on at length about this, but today I stumbled on some information on a topic I mentioned briefly several years ago: The weird way used book prices wobbulate around on Amazon. As it happens, the goofuses are apparently using software originally developed for high-speed stock trading. Techdirt explained the process in a little more detail last year, providing us (finally) a clue as to how a mild-mannered book on the genetics of certain flies could come to command the super price of $23,698,655.93. Lots more out there if you’re interested. In short: If you define your book’s price as 1.270589 times that of your competitor’s, and your competitor defines his price as 1.270589 times yours, well, you’ll both be rich in no time…or at least pricing your books as though you were. Fly genetics never had it so good. What remains a bit of a mystery is why you’d want to price your books above your competitor’s and not below. Unless…the game is to buy the book from your competitor when you find a buyer so dumb as to buy the book from you, at 1.270589 times the price they could get it elsewhere. It’s likely that the fly genetics book was not in either seller’s hands at any point. Such clueless buyers may exist–after all, people are still installing smileys and comet cursors and anything else on the Internet labeled “free.” This implies that the magic number 1.270589 is in fact the atomic weight of Sleazium, which absorbs certain subatomic particles, particularly morons, better than anything else ever discovered. I hit a milestone the other day: 40,000 words on Ten Gentle Opportunities, which is at least halfway there and maybe (if I’m willing to settle for a 75,000 word story) more than halfway. One of my readers sent a link to a page describing how to install the Insight debugger under Linux Mint. As my ASM freak friends will recall, I no sooner described Insight in Assembly Language Step By Step, Third Edition than Debian pulled it out of their distribution. Supposedly this method will also work for newer versions of Ubuntu. I need to test the repository under both distros, and will report when I do. There’s a new nova in Sagittarius. (Is that redundant?) Mag 7.8–which is easy to see with binoculars, if you can separate it from the stellar mosh pit in which it appeared. Thanks to Pete Albrecht for the link. Michael Covington sent a Google Ngram for the words “whosever” and “whoever’s” indicating that “whosever” has been on the run for a couple of centuries. It became the minority player about 1920 and has been down in the mud since about 1960. Ok, I agree: This is the most brilliant kitchen gadget since the salad spinner. Or before. Haven’t heard much about software radio recently. Ars Technica just had a nice overview piece on it. The hardware keeps getting better, but all the promised weirdness (including new types of pirate radio) hasn’t happened yet. My theory: Wi-Fi is just a better weirdness magnet. Foxconn is releasing a fanless nano-PC toward the end of summer, and I like the looks of it, at least if it’s got something better than an Atom in it. Roughly 7.5″ X 5.25″ X 1.5″. No optical drive. 5-in-1 card reader on the front panel. Under $300. To inflate a Buckyball, just use a laser. This sweet merlot (scroll down) was lots better than I thought it would be, especially for a hot summer evening’s barbecue. May be hard to find outside Colorado. No least hint of concord grape, for you mutant-blueberry purists. About $15. Yet another sign that we may be winning the Fat Wars: Fat-free dressing is bad for you. Still yet another sign may be that the grocery store near our condo outside Chicago carries a sort of spreadable lard called “smalec.” This is the best-kept secret in the food world; it took me ten minutes to even find a picture of it. It was brought here by Polish immigrants and is no less healthy than butter, though I have no clue as to its taste. This sure sounds like a hoax, but there could be a zombie apocalypse theme park in Detroit’s future. The concept suggests that time’s about up for the zombie craze, so I’d better get my novel (which contains dancing zombies) shambling on to completion before the whole thing caves in. This doesn’t happen too often, but today it stopped me cold: I was writing a paragraph from Ten Gentle Opportunities and couldn’t decide which of two usages was the right one. When there are two ways to say something, I generally have an intuitive sense for which is the more correct way, based on what I’ve read as much as what I’ve learned of proper grammar. This is one of the benefits of reading much and broadly. Carolyn stabbed the End Call button, and rose to go fetch her intern, or whosever intern he was. Carolyn stabbed the End Call button, and rose to go fetch her intern, or whoever’s intern he was. My (moldy) style books all say “whosever” but I hear “whoever’s” a lot more in recent writing. I think what we’re seeing here is a usage at the tipping point. In a few more years, “whosever” will become an archaism, and people will look at you funny when you say it. Is this good or not? I don’t know. Language evolves; sound and sense and all that. About the only thing I’m certain of is that I’m old. But I knew that.